Nab your free guide to Finding Your Passion before you go! Many clients come to me torn on what their next career move will be. I can speak from experience when sharing that you can be offered a higher title, with a larger salary, at a flashier company and still feel unfulfilled. Why? Because you need to have your core values in check before hopping into your next role. 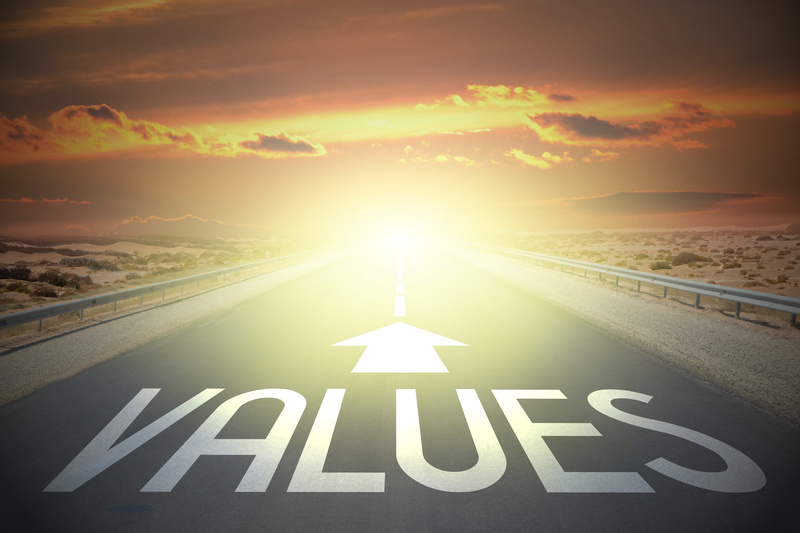 Your core values become the internal compass that guides you on the journey to your goals. When you feel lost, your values set you back on track. They are the heart of who you are and will steer you to your life and career vision. Interestingly enough, rattling off the first “obvious” values that come to mind is not always the way to go. Values based on fear are ones that cause you to take action to avoid something. These may be a strong reaction to your past, perhaps unconsciously adopted out of fear to prevent further trauma or repeat traumas from happening again. I have to land a job with xyz title or else my career trajectory will be harmed. I should go for xyz salary because it doesn’t make sense to drop lower than where I’m currently at. They may be connected to values we’ve inherited from our family or taken on from our culture without any awareness. These are the values that keep you safe & small, often times fueled by limiting beliefs. Conscious-based values allow you to take positive action. These are the “want to’s” – values that you are inspired to honor. I am inspired by a role where I can use my creativity. I want to lead a team because it inspires me to mentor others. These are the values that you are passionate about… that light you up inside. Which Type of Values to Honor? It may come as no surprise that chasing after fear-based values is a bit like a dog chasing its tail: always just out of reach, never getting anywhere, and pretty unfulfilling. Stay with me as I get just a tad bit deeper here. Fear-based values are representative of catabolic energy. This is draining, resisting, and contracting energy. While catabolic energy may offer some short-term benefits, when used on a long term basis, it imparts mental, emotional, and physical tolls that are potentially destructive to you, to your organization, and to all those around you. Fear-based values (or catabolic energy) in a nutshell, is simply not sustainable. Step 1: Click HERE to download a free “Surefire Guide to Finding Your Passion.”’ Page 5 provides a sample values list. Think about a time when life was really good. What value was being expressed or honored? Think about a time when you were upset. What value was being challenged? When do you compromise your values? Why? Take a look at what you MUST experience in life/career. Why is that so important? Is Your List Conscious Based or Fear Based? Step 2: Now circle the phrase that is the most powerful reason why this value is important to you. Still stuck? Try reframing your fear-based values as conscious based. Instead of avoiding a negative outcome, what is the positive outcome you are working towards? OK, now you’ve landed on your top 5 life values and top 5 career values. Rank from a scale 1-10, how high you “walk the talk” with this value in your life currently? In your career currently? What’s one step you could take this week, to rank yourself at least one notch higher with this value? When interviewing for a new role, what kinds of questions will you ask to uncover whether your values will be honored at your new role in the organization? Alright my friend, get to it! 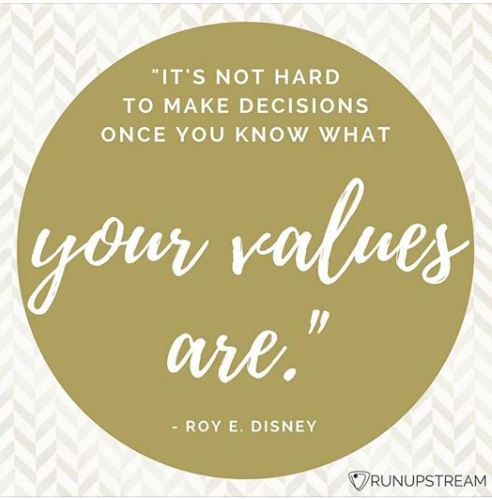 Once you land your values, you will gain so much clarity around why you currently feel stuck and will be able to begin developing goals and action plans that align to your truth. Here are some free values assessments just because you’re awesome! Got the Values. Need the Dream Career? Have you landed on your values and are you ready for the next step in discovering what dream career will honor these values? CLICK HERE for my Free Surefire Guide to Finding Your Passion. Betty Kempa, CPC, ELI-MP, is a certified career coach helping corporate women transition out of unfulfilling jobs and into their dream careers. Copyright © 2018. All rights Reserved. Betty Kempa. Web Design by Katie O'Brien.